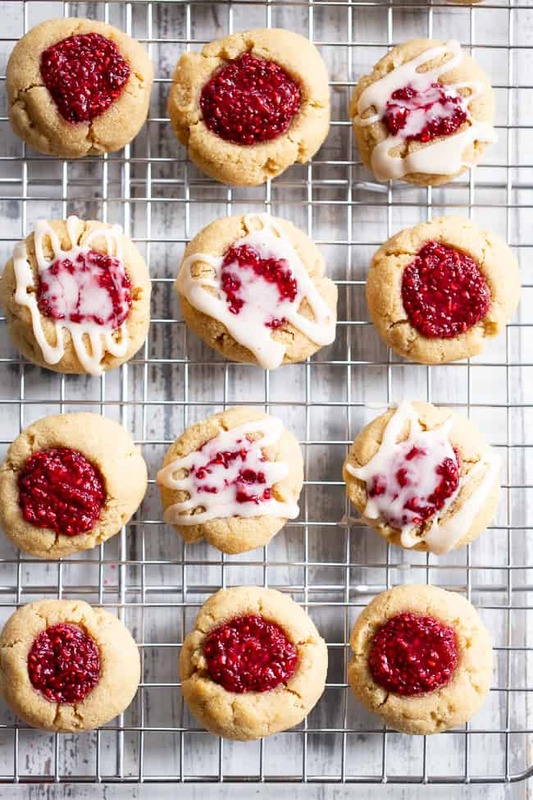 These classic thumbprint cookies use a simple raspberry chia jam with two options for the cookies – an original and nut free version that are both so tasty! Great for holiday baking or anytime! 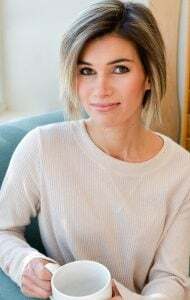 Gluten-free, dairy-free, refined sugar free. One of the most frequently asked questions I get is how to make a recipe that uses almond flour nut-free. The truth is, there’s no easy conversion unfortunately. Which is why I typically try to include a variety of baking recipes here that are nut-free for those with allergies. 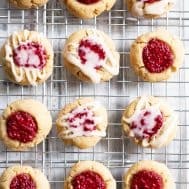 However, for today’s raspberry thumbprint cookies I decided to do something different. 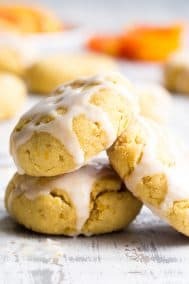 I created an alternative nut-free version of the cookies using coconut flour only. All the photos were taken of the original recipe that uses both almond and coconut flours. 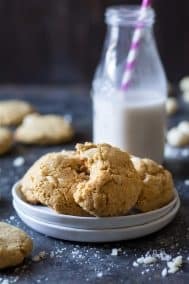 If you make the nut-free version, you’ll find that the cookies will spread less and have a slightly more dense and less soft texture. However, both versions got the go-ahead from family members who could barely tell the difference between the two versions. If you’re interested in comparing the properties of almond and coconut flour, this is a good recipe to look at. Even though I included coconut flour in the original recipe, I still had to make several changes to the wet ingredients to get the right consistency for the dough. 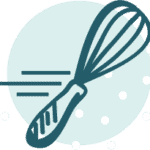 Coconut flour is extremely absorbent and also crumbly, so it requires extra eggs and extra liquids compared to almond flour. This is also the reason you’ll use so little coconut flour in recipes compared to almond flour. 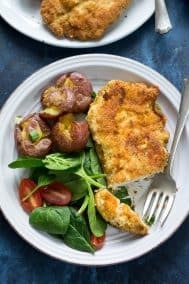 I typically will use about 3-4 times the amount of almond flour as I would coconut flour – that’s a major difference! 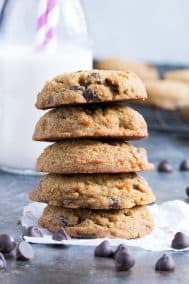 For example (though I haven’t tested this) if I were to try to make these cookies with all almond flour, I’d most likely try a total of 2 cups, tripling the amount of the coconut flour measurement. There’s no exact science that I’m aware of when it comes to converting the two flours. But, through trial and error, I’ve found that for every 1 cup almond flour, you need only 1/4-1/3 cup coconut flour. Additionally, many times, you’ll need an extra egg as well. Was that enough confusing baking science for you? Because I think I’m ready to move onto the raspberry jam! 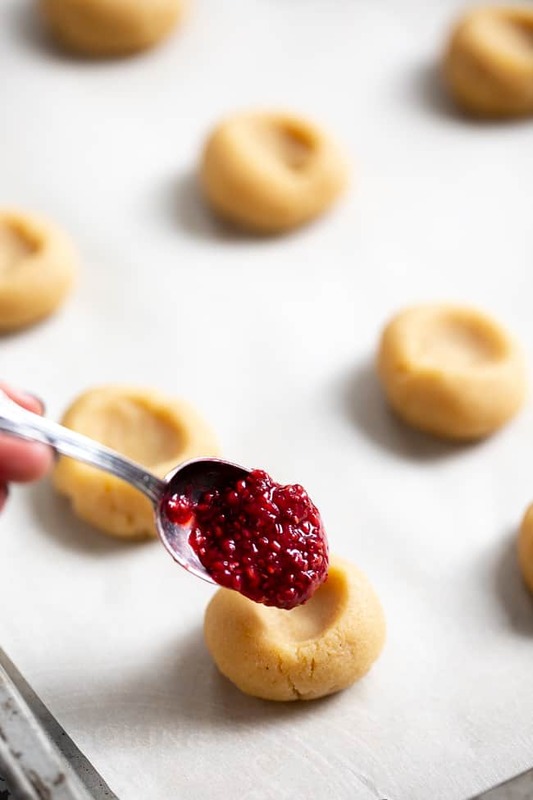 I decided to go with a really simple chia jam for these cookies. A paleo and vegan jam that you can make with just 3 ingredients in about 10 minutes. Chia jam is really just as easy as cooking fruit along with a sweetener and some chia seeds to thicken it. You can sub in another berry if you like here, and might also want to puree the fruit first if you’re using one that doesn’t break down as easily as raspberries. 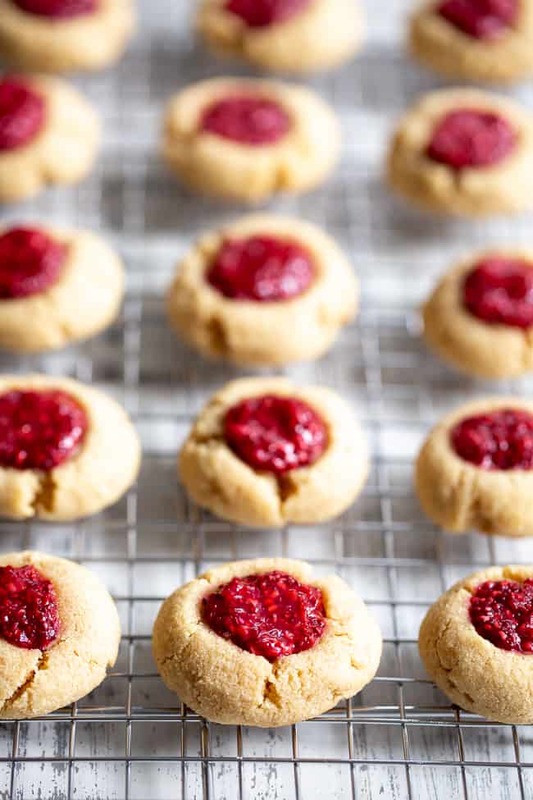 The result of putting it all together – soft, flavorful cookies baked with a fruity jam right in the middle – totally irresistible! Since I wanted these I even drizzled a little white icing over some of them. Check out my strawberry pop tart recipe for details on how to make the icing. I hope you’re ready to bake these fun, addicting little cookies! Grab your ingredients and an apron (raspberries!) and let’s go! 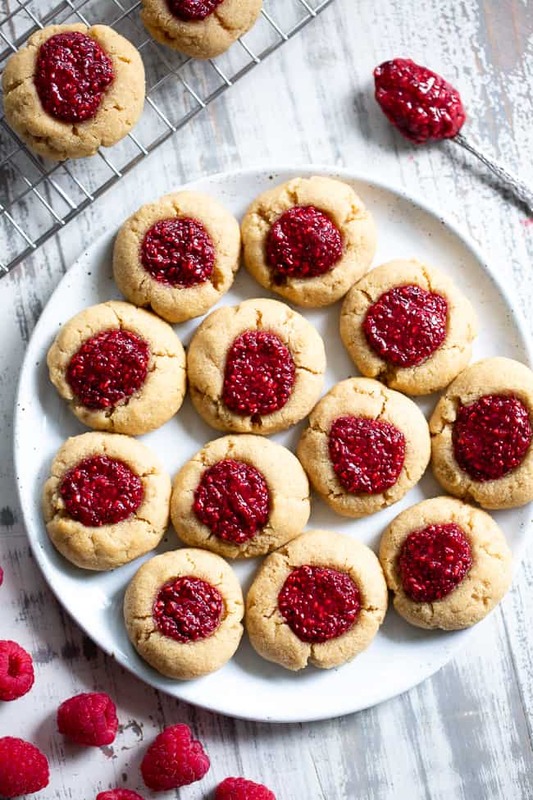 These classic thumbprint cookies use a paleo raspberry chia jam with two options for the cookies - an original and nut free version that are both so tasty! Great for holiday baking or anytime! Mix dry ingredients in a medium bowl and set aside. In a separate bowl, whisk together the egg or eggs, maple syrup, coconut oil and extracts. Stir the dry ingredients into the wet until a sticky dough forms. Chill dough in the refrigerator for at least 30 mins. 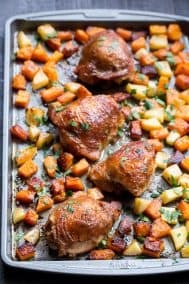 Preheat your oven to 350 degrees and line a large baking sheet with parchment paper. 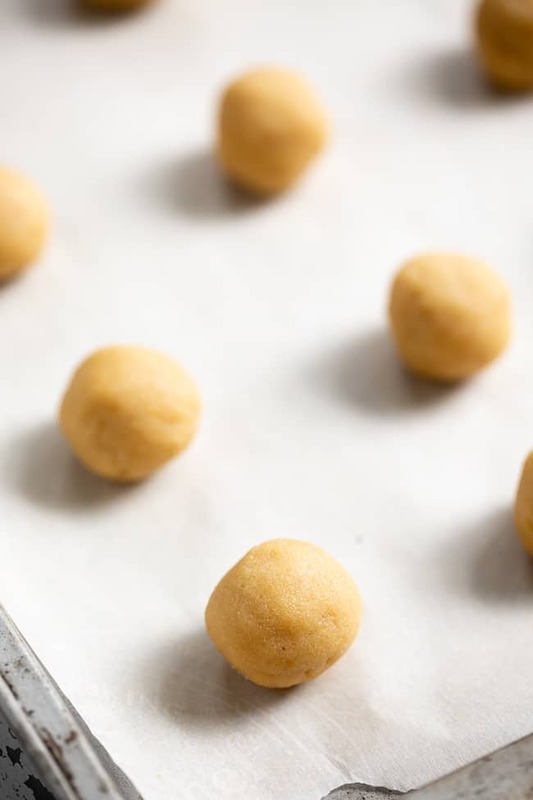 Roll dough into 15-18 balls and place on baking sheet. Press your thumb or a 1/4 tsp in the center of each ball, then spoon 1/2 tsp of the jam into each. Bake in the preheated oven for 10-12 mins or until set and beginning to turn light brown. Remove and allow to cool 5-10 mins on the baking sheet, then remove to wire racks to cool completely. In a small saucepan, heat raspberries over medium heat until saucy and bubbling, mashing them with a spoon as they cook (about 3-5 mins). 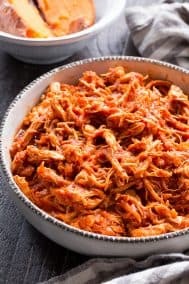 Add the maple syrup, stir, then add the chia seeds and continue to cook and stir, lowering the heat a bit to med-low, for about 5-7 more minutes or until thickened. Remove from heat and allow to cool 5 mins, then transfer to a jar to cool completely. *Nutrition is calculated using the original version. 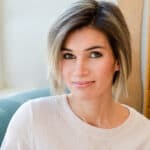 Thank you so much for the information about converting (or not!) for coconut flour. This will be very helpful for me. I would also like to know how to make recipes with banana flour. It seems to me to be more digestible than coconut flour but I cannot substitute directly. Is there a conversion? I cannot find many recipes using banana flour either- so I do need to learn how to substitute it. I love thumbprint cookies! These look gorgeous and perfect for Christmas! I made the nut free version but it is ceumbly, any suggestions? I love that you offered two different versions for these cookies! 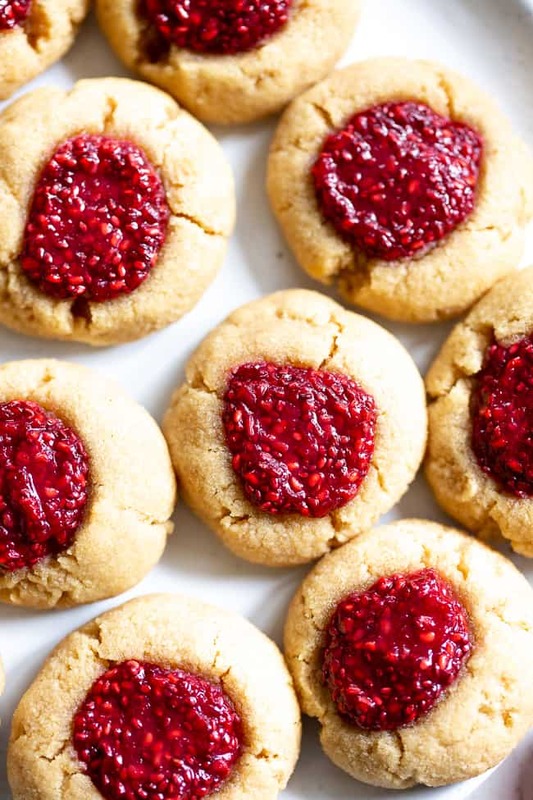 I love making homemade chia jam too, so these cookies are perfect! 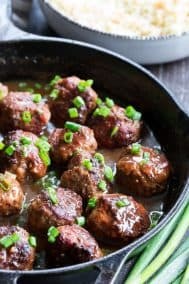 Any way to make them egg free as well? 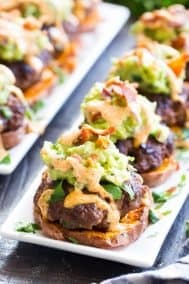 how do you make the white drizzle on top? I completely missed the part about cooking the chia jam! Oh well. The cookies didn’t come out as pretty but they still taste delicious. I added a little less maple syrup in the cookie mixture and jam and they came out the right sweetness, at least for me. I didn’t have lemon extract, so I used lemon zest, which was great. Plus, I added 1/4 tsp of almond extract, and it was a great addition. Thank you so much to your permission here to share my thought about windows 10 OS computer Only this tutorial is helpful to learn clipboard https://clipboardwindows10.com/ feature of Microsoft. I am so impressed with this help.